The Haryana Forest Department’s action of “exonerating” a Forest Range Officer found guilty of embezzlement of government funds worth over Rs 3 lakh and placing under suspension another Forest Range Officer, who lodged an FIR against the accused, has raised many an eyebrow. 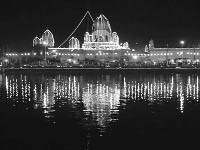 The historical Kapal Mochan Mela concluded today as about 10 lakh devotees took the holy dip at the stroke of midnight in the three historic sarovars. In another move to keep a strict vigil on criminals and anti-social elements, the Karnal police has launched a drive for mandatory registration of paying guests. The Haryana Government is setting up night shelters in all districts of the state to facilitate urban homeless persons. Such shelters have either already been constructed or are under construction. The Haryana Civil Medical Services Association (HCMSA), a representative body of government doctors in the state, has cancelled its proposed strike from tomorrow follow negotiations with the government. The police arrested two suspects involved in demanding a ransom from an owner of a showroom in Jambheshwar Market here today. They have been identified as Sunil and Ramphal. The police has also recovered a motorcycle and a pistol used in the crime. The DLF Golf and Country Club, Gurgaon, has been adjudged the Best Golf Course in India at the annual Asian Golf Monthly Awards ceremony at Pattaya, Thailand, recently. Aakash Ohri, director, DLF Golf Resorts Ltd, received the award at a gala ceremony held on Nov 3. In a hit-and-run case, a drunk driver hit a cyclist and dragged his bicycle for 5 km before he was forced to a stop by a chasing policeman and arrested last evening. Two youths died of electrocution, while another died of burns in three different incidents in the district today. In his orders issued on November 4, the Principal Chief Conservator of Forests (PCCF), Haryana, has placed Prithvi Raj, a Forest Range Officer (Production Division), under suspension for lodging an FIR against Rajesh Kumar, Forest Range Officer, and then posted in the Territorial Division at Rania in Sirsa. The orders said that Prithvi Raj, Forest Range Officer (Production), Sirsa had committed an act of indiscipline by lodging an FIR against Rajesh Kumar, though he was not competent to do so. The PCCF, Haryana, Chhotu Ram Jotriwal, has also directed the Divisional Forest Officer, Hisar, to withdraw the FIR registered against Rajesh Kumar and send the draft of the charge sheet against Prithvi Raj to him. Prithvi Raj had lodged an FIR in this regard against Rajesh Kumar, Forest Range Officer (Territorial Division), posted at Rania on July 27, for criminal breach of trust, cheating, forgery and under various provisions of the Prevention of Corruption Act for the alleged embezzlement of Rs 3,56,095. The FIR was lodged on the directions of Sanjiv Chaturvedi, Divisional Forest Officer (Production), after an inquiry conducted by KC Meena, Conservator of Forests, Gurgaon Circle, had found Rajesh Kumar guilty of the charges and recommended criminal proceedings against him. Earlier an audit party had also found Rajesh Kumar guilty of the charge and had recommended criminal proceedings. The complaint said that Rajesh Kumar, who was Forest Range Officer (Production) at Sirsa in 2002-03, allegedly sold 103.068 cubic meters timber belonging to the department to contractors and did not deposit proceeds amounting to Rs 3,56,095 with the government. The Principal Chief Conservator of Forests, Haryana, had appointed Meena inquiry officer in this case on February 4, 2008. After the registration of the FIR, Rajesh Kumar deposited the money with the state exchequer. Now, for strange reasons, the PCCF has ordered the withdrawal of the FIR and has also ordered suspension of a Forest Range Officer, who merely acted on the orders of his superiors to register an FIR against his colleague. Jotriwal said he was in Karnal and hence he was not in a position to say anything on the matter. He, however, said the FIR against Rajesh Kumar had not so far been withdrawn. The three-day fair is held on Kartik Purnima every year at Kapal Mochan in Bilaspur, about 25 km from here. The devotees lit ‘diyas’ on the banks of the sarovars, presenting a picturesque scene. The pilgrim spot is known to have been the workplace of Maharshi Ved Vyas. 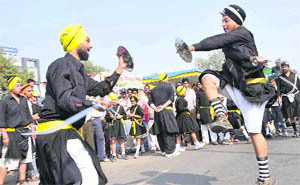 A large number of Sikhs also visited the mela as the holy place has a great following among their community too. In 1687, Guru Gobind Singh had rested here for 52 days after the Bhangani battle. Dinesh Yadav, Additional Deputy Commissioner, today said that no major untoward incident took place during the fair. A cattle fair was also organised in which a number of animals of high breeds fetched a good price. An exhibition depicting activities of the various departments of the district was one of the main attractions of the fair. A cultural show was also organised by the Public Relations Department of Haryana. There has been a sharp increase in the number of paying guests, especially students and employees in Karnal and adjoining areas due to mushrooming of educational and professional institutions in the region and opening of new job avenues like call centres but it is difficult to verify their antecedents as no official records exists. The mandatory registration of paying guests by owner would make it easy for the police to identify them and dig out their criminal background, if any and facilitate crime investigations, Rakesh Arya, Karnal SP, said. All police stations had been directed to keep a record of paying guests with their ID proofs, he added. The paying guest business was flourishing in Karnal and other towns as students, workers and employees, who could not afford the soaring rents, prefer to stay as the paying guests and landlords also find it convenient to subvert the Rent Control Act and evade taxes by describing them as paying guests and not tenants. Already, thousands of paying guests were living in Karnal but not even one of them was registered as the owners were least interested and they don’t even verify their ID proofs, Arya said. Normally, a group of four or five persons hailing from different places and background stay together in a small rented accommodation and it becomes difficult even for a landlord to verify their identity. While the names of tenants were registered with the authorities by landlords, they shirk to register paying guests but the drive launched by the police would ensure that the paying guests were duly registered. The police would keep a watch on landlords and also the places where paying guests are being lodged and in case it is found that they have not been registered, action would follow, he added. It was strange that domestic servants, workers and labourers coming from outside were registered and required to give the ID proofs but no such provision had so far been made in case of paying guests even though hoardings, play cards and advertisements offering paying guest accommodation were a common sight in the city. The night shelters are being constructed on the directions of the Supreme Court to arrange food and night stay and other facilities for urban homeless persons. The apex court had asked the state to set up at least one permanent shelter, which would be open 24 x 7, for each one lakh population in each city. In Hansi, Yamunanagar, Jagadhri and Sirsa, either these shelters have been constructed or are under construction whereas in Faridabad, Rewari and Sonepat, the process to set up such shelters has been initiated, which includes identification of land, site, preparation of estimates and construction work. In Sirsa, homeless people will get this facility by December this year as the night shelter costing Rs 14.20 lakh is nearing completion adjacent to Jeevan Singh Jain Park. The homeless could contact Kasturba Gandhi Vridhashram or Apahij Ashram near old Prabhat Cinema or office of the District Red Cross Society, Sirsa, to avail of the facility of night shelter. SDM Roshan Lal has been made overall in charge of the scheme and the District Red Cross Society has been made the nodal agency. The decision to cancel the strike came after a long meeting between representatives of the HCMSA and government officials led by Navraj Sandhu, Financial Commissioner and Health Secretary, which continued beyond midnight last night. Announcing the decision here today, Rajesh Kumar Khyalia, president of the association, said the negotiations end on a positive note and the government assured the doctors that it would act on their demands. The government had asked for sometime to which the doctors agreed. The health services in the state were partially affected when the government doctors proceeded on mass casual leave on November 8 and November 9 in support of their demands. Earlier, they had threatened to go on an indefinite strike from tomorrow if their demands were not met till today. Khyalia said the government had agreed to most of the demands of the doctors barring two. The Health Secretary told the doctors that as the Model Code of Conduct was in force in view of the November 30 byelections in Adampur and Ratia, it would take some time before the government could act on their demands. He said the matter was discussed by the core committee of the association. It was unanimously decided to suspend the agitation till December 27. Khyalia said the doctors would be back to work tomorrow. Among other things, the doctors are demanding that the post-graduation policy should be modified to facilitate more and more doctors to be eligible for the qualifying for the PG entrance test to meet the shortage of specialists. Ashwin Shenvi, SP, said the motive behind the crime was not to seek the ransom but to facilitate the transfer of two criminals, Somvir and Sunder, lodged in the Tihar Jail in Delhi to a Hisar jail as they felt insecure there. He said the duo kept meeting another inmate of the Hisar jail, Sandeep, during their hearings in a Delhi court in a murder case. During one of these meetings the two Tihar Jail inmates expressed their desire to be somehow shifted to the Hisar jail. Sandeep told them that this possible if a ransom demand was made in their name in Hisar. Sandeep while in the local jail summoned Sunil and Ramphal to the jail and asked them to demand the ransom from a businessman and hand him over a letter purportedly written by Somvir and Sunder. The suspects went to a showroom and handed over the ransom note to the owner on October 25. Before, fleeing from there they fired a shot to create a stir. The Asian Golf Monthly Awards are based on an online poll of Asian Golf Monthly readers, who comprise noted figures associated with the game of golf. DLF Golf and Country Club has enjoyed the distinction of being adjudged the best course for three consecutive years. In 2007, it was conferred the award for the best course in the subcontinent and for the best course in India in 2008 and 2009. The victim who fell in the bushes after the accident was later found seriously injured, but he died before he could reach a hospital. He has been identified as Subhash (35), a factory worker. According to the police, the victim was returning home from the factory when he was hit from behind by a Maruti car near Talwandi Rana village. While the victim fell in the roadside bushes, his bicycle got entangled under the bonnet of the car. A policeman, Sunil Kumar, who was buying vegetables from a rehri near the Barwala Road octroi post, noticed sparks from under the speeding car’s bonnet. He chased the car on his motorcycle and ultimately forced it to a stop near the bus stand here. The driver, Vinod Sharma, who was drunk, was arrested. Yuvraj (18) was repairing some electric connection in a store on the local Barnala Road, when he was electrocuted. In another incident, Rakesh of Bakrianwali was cleaning the roof of a private bus on which he worked as a conductor. He accidentally touched the overhead electric wires and died on the spot.